I went to Kochi for dinner with my aunt and cousin. It's located at 1936 South King Street, right next to Jimbo's. It was okay, nothing spectacular. The menu did offer many choices, including the typical two or three choice dinner combinations. 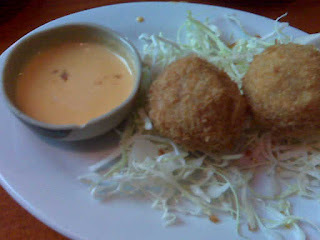 We tried the hash balls, and true to form, they were corned beef hash rolled in panko flakes (Japanese bread crumbs) and deep fried and served with a spicy cheese sauce. 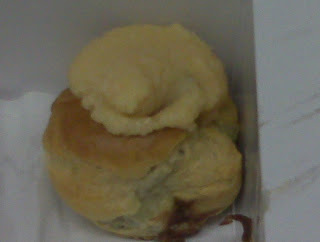 It honestly was not that impressive as it tasted like canned hash and processed cheese spread. My aunt & cousin got the 3 choice with various entrees (tempura, steak, salmon). I opted for the furikake mahimahi which came only as an entree so I ordered a shiso musubi (perilla leaf rice ball) on the side. The portion size was huge, 3 fillets of mahi. 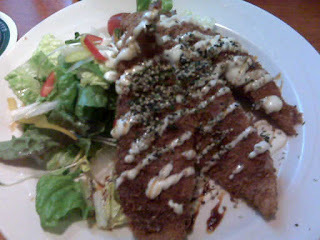 I was pretty disappointed as the "furikake" was only sprinkled on top and not incorporated into the panko crust. Everything was on the salty side, but tasty. I think if I go back, it will be just for drinks and pupus and not for dinner.